Following on from my earlier posts on US wealth inequality, I went looking and found another (more awesome) clip – this time, it’s on global wealth inequality. And here’s the link for anyone that can’t see it in their inbox. Split the world’s population into fifths. 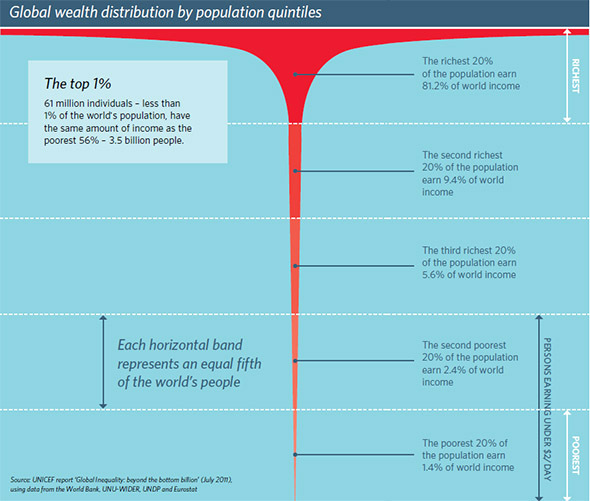 Start with the assumption that the world’s wealth should be split equally between each fifth. Then stop making that assumption. Which is “shocking” (and remarkably similar to what we see in America). Oh, and of course, there’s the standard anger-rousing statistic: “The richest 300 people have more money than the poorest 3,000,000,000 people combined”. But as I’ve said previously, it isn’t that shocking. I mean – not really. The wealthy are wealthy because they have most of the wealth. Otherwise, they’d just be middle-class or poor. Also, as a general aside, surely that bottom 3 billion are going to include all of the world’s children? I don’t know – maybe the statisticians factored for that. Then the video gets really interesting. 200 years ago, rich countries were only three times richer than poor countries. By the 1960s, they were 35 times richer. Today, the multiplier is 80. *which isn’t quite the same as wealth – but it’s correlated enough to be close. *Although does anyone notice that little red spot to the right of the lines that are Africa and Madagascar? Looks like Mauritius! Although China is doing pretty well by comparison – despite being very much a central-planning state with strict capital controls and all the neo-liberal free-trade no-nos. In fact – the Asian countries in general seem to have managed just fine. 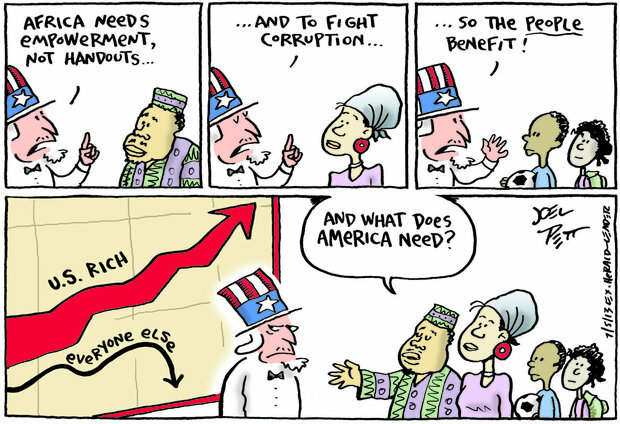 They give developing countries around $130 billion in aid each year. Around $900 billion per year leaves developing countries via transfer pricing. A further $600 billion per year goes to interest repayments on debt. An estimated $500 billion per year gets “lost” through free trade rules imposed by global institutions (like the IMF and the WTO) on developing countries in return for aid. Total debt servicing cost: $620 billion in 2010, according to the World Bank’s Databank and International Debt Statistics report. I couldn’t find a direct source for the $500 billion number – but it seems to come from a book by Richard Pollin, an economist at the University of Massachusetts. Richard Pollin is most famous for pointing out the mathematical errors in the Reinhart-Rogoff paper on financial crises last year (there was an excel spreadsheet fail), so I’m not sure if that’s a good indicator of his math ability. Either way, I wasn’t going to go in search of “Contours of Descent” (the book) just to find the line where he “estimates” the impact. So let’s just accept $500 billion because it makes the numbers easy to work with – and it doesn’t really change the principle (just the magnitude). So in summary, in return for about $130 billion of aid, around $2 trillion worth of wealth leaves the developing world for the developed world every year. I feel like this calls for a post on Free Trade! Hey great blog. Do your numbers add up on the transfer of world funds? 130 billion v 2 billion…. Haha – thanks man! You are so right – it should be $2 trillion, not billion. I’ve amended it! you say (according to the world bank) the debts serving costs are 620 trillion $. That is 1000 times what the rulers say.